Deciding on counter tops for any room in your home can be a tough decision, and there are many new materials out there for you to consider. But one that stands out above the rest is quartz. Quartz is a natural mineral, plus it is very hard, giving it great durability. This versatile stone is a beautiful addition to your kitchen or bathroom, and there are many positive aspects to consider when comparing it to granite counter tops. 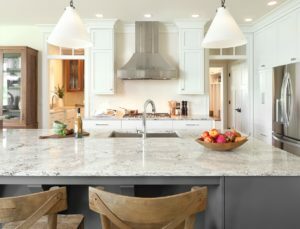 When comparing quartz to granite, you’ll find a significant difference in price. Granite can be sourced from many different places around the world, including Brazil and China. Although granite is quite beautiful, shipping it in from exotic places can be quite expensive. Because quartz can be manufactured, the price per square foot will help you stay within budget, all while getting the look and feel of granite. Many quartz counter tops are created by combining about 95% natural quartz, and a small amount of resin and pigment. This means that not only do you receive quality counter tops in your home, but you also get a wide variety of styles and colors to choose from! No matter what room you’re adding this beautiful stone to, you’re sure to find a texture, color, and pattern that fits your exact style. Another aspect of quartz that many people love, is the fact that it in non-porous. 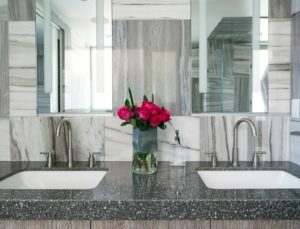 Stone like marble and granite have tiny pockets and channels, creating the perfect environment for bacteria growth and staining. In order to prevent this, marble and granite need to be sealed regularly. Quartz is a non-porous material, meaning you don’t have to worry about bacteria on your counter, and no opportunity for a spilt glass of wine to stain your counter. Quartz never requires sealing, and because it’s a non-porous material, works perfectly in your kitchen for food preparation. Quartz is a naturally hard material, and when it’s combined with a small amount of resin, creates an extremely hard stone, and much stronger than granite or marble. A quartz slab is the same working thickness, and is process and cut using the same machines and equipment as granite or marble. 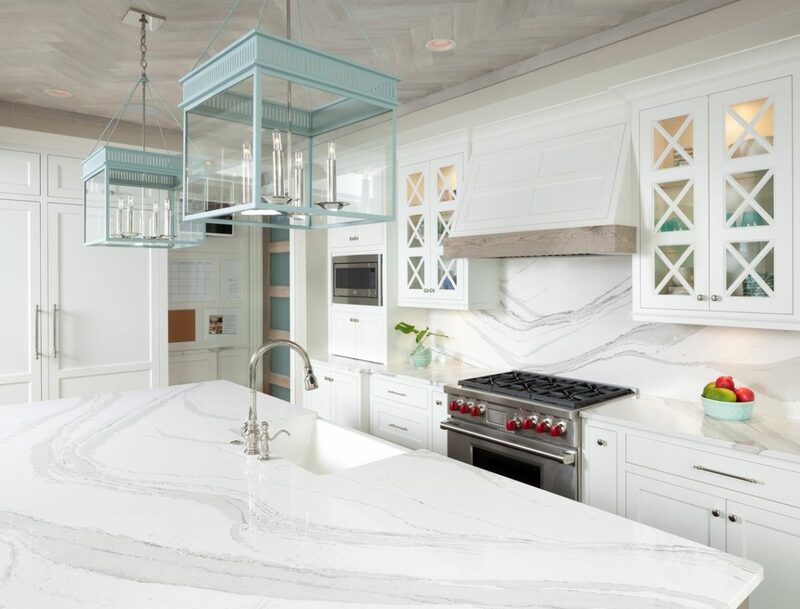 If quartz counter tops sounds like a perfect fit for your home, contact Crawford’s Home Furnishings for more information on how we can help you find the perfect quartz for you.